Carrot Cake Baked Oatmeal - Perfect lazy weekend breakfast! With the weekend coming up, I always think about baked oatmeal. Why?! Because there’s nothing cozier than freshly baked oatmeal served with a cup of Matcha Latte on the weekend morning. Actually, the whole magic of baked oatmeal is in the option to prep it the night before. That way you don’t have much fuss around breakfast in the morning. You just pop the casserole dish in the oven and while you do your usual morning routine, the breakfast is baking. In no time you have your nutritious, super delicious breakfast ready. I tell you, it’s the easiest family breakfast EVER. Sometimes when I’m super tired, I just send my hubby to do all that. I sleep a bit longer and soon I have beautifully baked oatmeal served in the bed right upon awakening. Well, this is LIFE! A well-deserved break for busy mums. Baked oatmeal is easy to make dish that is fully adaptable depending upon your desires and current moods. I usually follow what’s in season and make baked oatmeal with seasonal fresh ingredients. 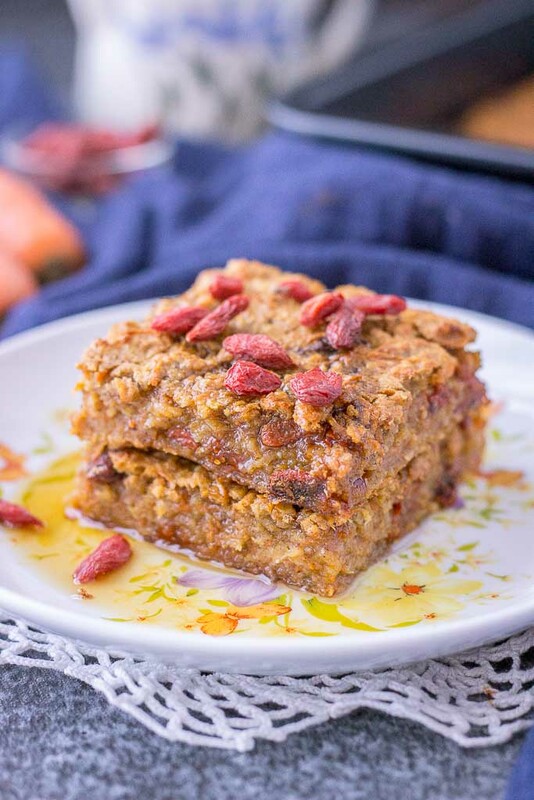 This delightfully sweet and flavorous Carrot Cake Baked Oatmeal is tailored to celebrate Spring season… along with this yummy Carrot Cake Overnight Oats that I’ve been killing for the past week. This baked beauty is loaded with healing spices, HEALTHY ingredients, and fresh beautiful carrots. It’s a breakfast you’ll be really looking forward to in the morning. What do you need to make this Carrot Cake Baked Oatmeal? To make this baked oatmeal you’ll need just a few simple pantry ingredients. Oats: You can use old-fashioned rolled oats or quick oats here. Both are equally healthy and equally tasty. There’s only a bit difference in the texture depending on which one you use. Rolled oats absorb more liquid thus giving the nice dense texture while quick oats give much softer, mushy texture. I use one I have at hand in the house. I’m a pretty simple, very practical lady. Milk: I personally love to use organic soy milk because it’s naturally sweeter than other dairy-free milk. That way I don’t have to add much additional sweetener. But both dairy or other plant-based milk is fine here. Use the one you prefer and like – or have in the house. Egg: I like to use free-range chicken eggs when baking so that’s my preference here in this recipe. But if you’re following the vegan diet you can easily swap regular egg for flax or chia egg. To sweeten this smasher I used maple syrup although date syrup is a great option too. Also adding vanilla uplifts the whole dish to another level, so don’t skip the vanilla part. Ceylon cinnamon that gave unbelievable flavor but also enhanced the dish with many health benefits. Goji berries loaded with vitamin C, iron, vitamin A, zinc and powerful antioxidants. Antioxidants are known for their immune-boosting qualities and their ability to fight harmful free radicals and inflammation. But the real star in this baked beauty is a CARROT. Fresh, sweet and loaded with nutrients. A SUPERFOOD too! Carrots are now in season and just beautiful. When baked, carrots soften giving amazing silky texture to this baked oatmeal. So yummy! This delicious, sweet and incredibly flavorful Carrot Cake Baked Oatmeal is perfect morning treat. It’s loaded with nutrients, super-spices and SUPERFOODS. + It’s refined sugar-free… meaning totally guilt-free! I dig that! AND it’s so tasty and unbelievable that it feels like eating favorite carrot cake dessert for breakfast. I dig that too! A LOT actually. It’s a breakfast that can easily make your weekend more exciting! Carrot Cake Baked Oatmeal is an easy, super nutritious make-ahead breakfast filled with incredible flavors and sweetness. It's a delightful morning meal packed with wholesome ingredients, carrots and SUPERFOODS. Refined sugar-free and super HEALTHY! Preheat oven to 375°F (190°C) and lightly grease an 8.6" x 8.6" casserole dish. In a large bowl, mix together oats, baking powder, cinnamon, nutmeg and salt. In a medium bowl, whisk together the wet ingredients: milk, egg, maple syrup, vanilla, and coconut oil. Add the dry mixture to wet mixture and stir until combined. Mix in grated carrot and Goji berries. Pour mixture into prepared casserole dish and smooth out with a spoon. Bake for 40 minutes until lightly golden along the edges. The oatmeal will still look a bit soft or wet in some spots when it comes out of the oven, but it will firm up as it cools. Let cool for about 5 to 10 minutes before serving. Drizzle of maple syrup, or vanilla non-dairy yogurt. Keep leftovers for up to 5 days in the fridge or up to 3 weeks in the freezer. Enjoy it warm or chilled straight from the fridge! For GLUTEN-FREE: Use certified gluten-free oats. For VEGAN: Use flax or chia egg. PREP the night before: Prep the mixture and put it in the casserole. Cover the casserole dish with foil and place it in the fridge overnight. In the morning, remove the foil and bake. Looks so moist and delicious! Love how healthy this cake is. If only I can have this cake for my breakfast all days.